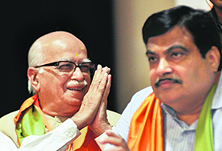 With Nitin Gadkari facing a fusillade of charges, including dubious sources of investments in his companies, veteran BJP leader LK Advani today came out in strong defence of the party chief. After Saudi Arabia started cooperating in nabbing terror suspects, Indian agencies now have a better understanding of how Indian youths settled abroad are being used to wage a war against their own country. Despite an �avoidable misunderstanding� with coalition partner, the Congress, over reservations in elections to block development councils in Jammu and Kashmir, Chief Minister Omar Abdullah looks forward to tackling all issues and completing his full term. Raj Chengappa at his Srinagar residence on a range of issues. Amid efforts to attain WHO�s polio-free certification, India has identified around four lakh settlements that are at high risk of polio virus transmission. The knot Nishan Singh tied with trouble by marrying a minor may not turn into a noose, if Shruti stands by her man. Their marriage may be "voidable", as Shruti is a minor; and their case may be covered under the Child Marriage Restraint Act and the Prohibition of Child Marriage Act. 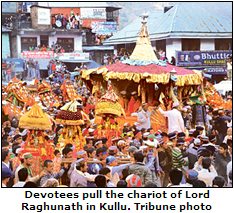 Amidst the beats of dhol and the vibrant sound of �shehnai� and cymbals played by the �bajantris� � traditional musicians � the sacred �rath� (chariot) of Lord Raghunath pulled by thousands of devotees rolled out with gaiety, kick-starting the weeklong international Kullu Dasehra festival at Dhalpur Maidan here today.